The Ruta de las Misiones (Mission Route) is mainly a cultural itinerary, which traverses a relevant part of America’s history. 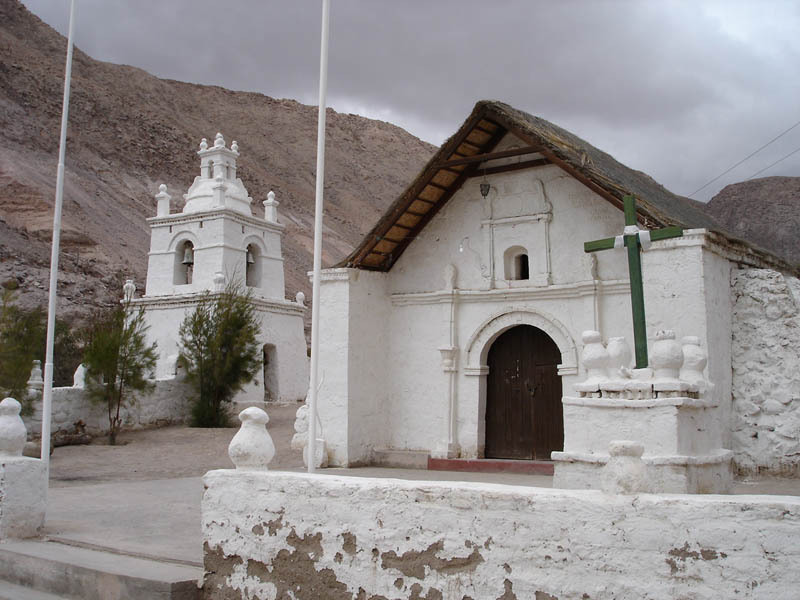 The Andean churches of the region of Arica and Parinacota are part of what is called the Ruta de la Plata (Silver Route) or the “Camino Real (Royal Road) Potosí-Arica”, road over which during two and a half centuries all the silver from Upper Peru was brought to the Port of Arica and from there to Spain. 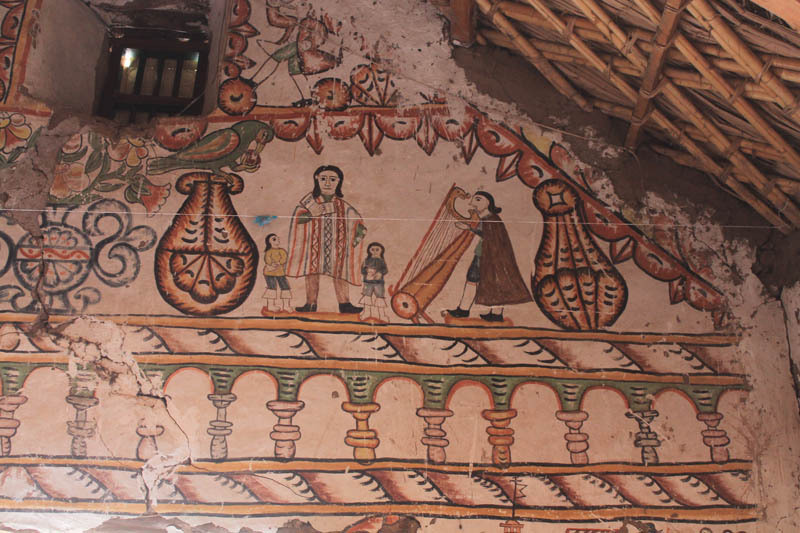 The Andean churches originate around this important commercial artery, the most important of the Spanish Empire, and nowadays form one of the most remarkable heritage ensembles, linking them to esthetical manifestations of Andean baroque. The proposed circuit goes from the Pacific Ocean to the desert, mountain range and Altiplano, large part of this fascinating history. Visit of more 10 colonial churches. Combines desert, mountain range and Altiplano. Lauca Biosphere Reserve and Isluga Volcano National Park. Culture – Nature – Walks. Day 1: Santiago-Arica. Transfer in hotel. Night at hotel. Day 2: Arica-Codpa. Visit Azapa vally and archaeological museum. Transfer. Visit churches in Pachica and Esquiña. Night at hotel (1,850 masl). Day 3: Codpa-Belén. 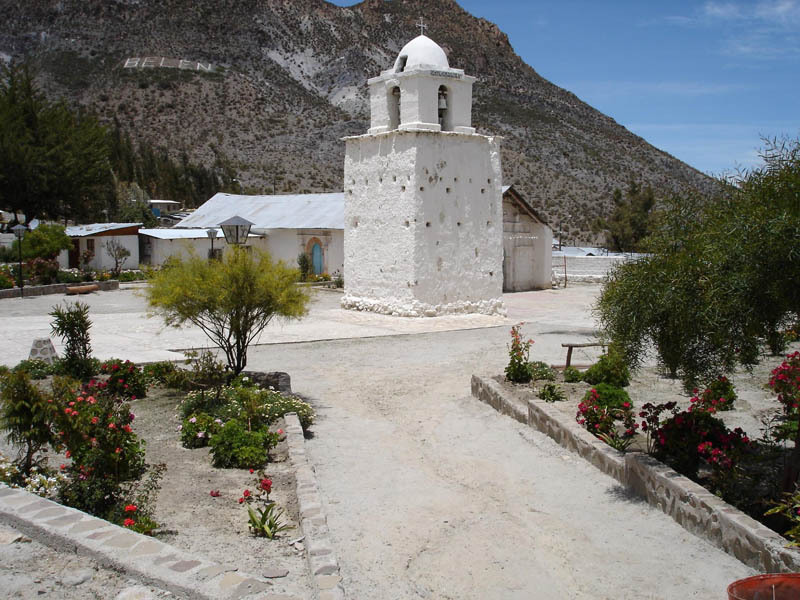 Visit churches in Codpa, Guañacagua, Ticnamar and Belén. Night at family hostel (3,260 masl). Day 4: Belén-Socoroma-Putre. 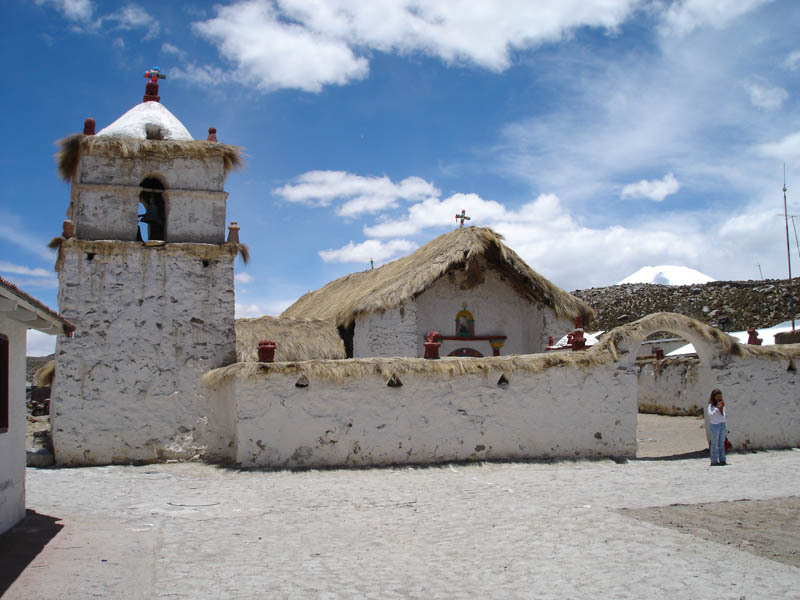 Visit churches in Pachama, Socoroma and Putre. Downward walk to Socoroma. Night at hotel (3,500 masl). Day 5: Putre. Cave paintings of Vilacaurani trekking (2.5 hrs there and back). Afternoon: Visit Jurasi hot springs. Night at hotel (3,500 masl). Day 6: Putre-Visviri. Visit Colpitas, Suriplaza localities, Cosapilla church, Visviri (triple border). Night at family hostel (4,300 masl). Day 7: Visviri-Caquena-Parinacota. 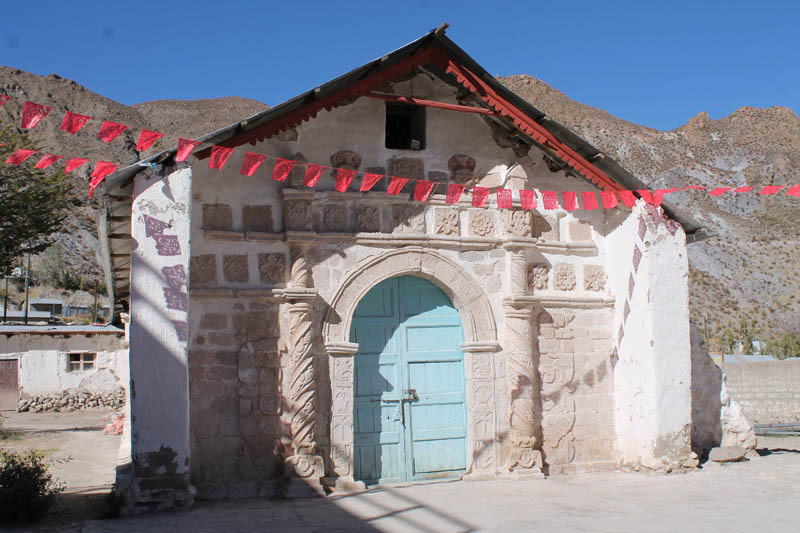 Visit churches in Chujlluta, Caquena and Parinacota. Night at family hostel (4,400 masl). Day 8: Parinacota-Chungará-Guallatire. Visit Cotacotani lagoons, Chungará Lake, Guallatire church. Night at family hostel (4,300 masl). Day 9: Guallatire-Surire-Mauque-Colchane. Visit churches in Parajalla, Mauque and Isluga. Walk along the shore of Salar de Surire salt flat. Night at family hostel (3,700 masl). Day 10: Colchane-Salar del Huasco salt flat. Sillajuay pass (5,070 masl). Visit churches in Cariquima, Ancuaque and Lirima. Night at family hostel (3,600 masl). Day 11: Salar del Huasco salt flat-Pica. Walk along the shore of Salar del Huasco salt flat. Visit church in Pica. Night at hotel (1,330 masl). Day 12: Pica-Iquique. Visit church in Matilla and La Tirana Sanctuary. Visit Humberstone ex nitrate mining office. Arrival at Iquique. Night at hotel. Day 13: Iquique. Visit city of Iquique. Day 14: Iquique-Airport. Transfer out.